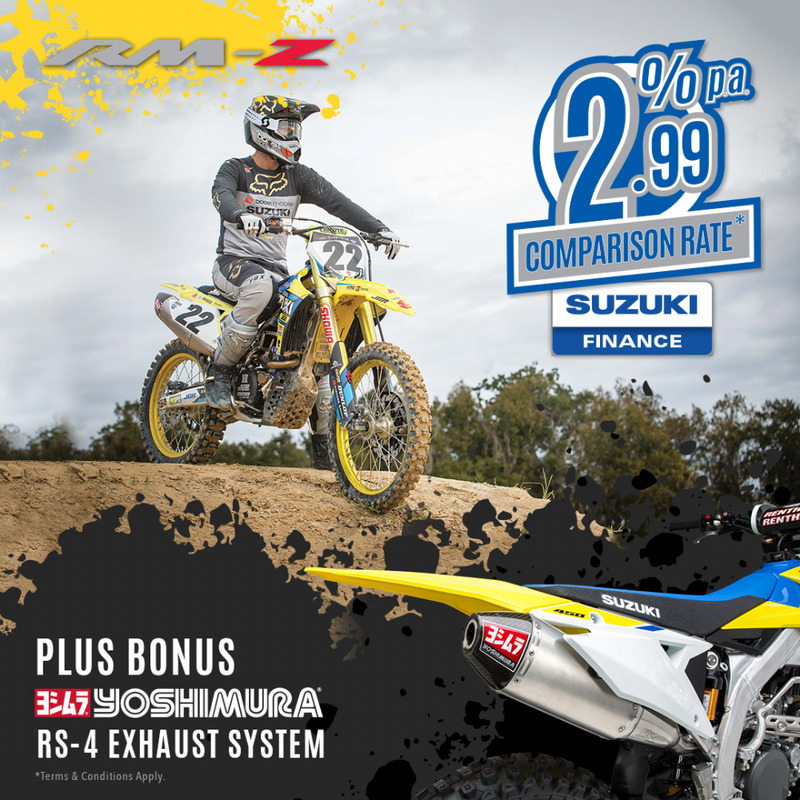 2.99% p.a Comparison Rate Finance on Suzuki RM-Z Range! Motocross is a relentless game, and the technology and training needed for bike and rider to excel are too. Suzuki poured more than 40 years of racebike engineering into the 2018 RM-Z range, making them the hardest-hitting, sharpest-handling, best-balanced and most rider-friendly production motocrossers in the company's history. Now for a limited time you can receive a 2.99%p.a. Comparison Rate from Suzuki Finance plus a Bonus Yoshimura RS-4 FS SS-AL-CF Exhaust ($999 Value)! * Terms and conditions apply. Finance for eligible credit approved applicants only. The comparison rate of 2.99% is based on a secured loan of $30,000 for a term of 5 years at the annual percentage rate of 2.22%. The amount of credit provided to you and the term of the loan may be different to this. WARNING: The comparison rate only applies to the example given and may not include all fees and charges. Different terms, fees or other loan amounts might result in a different comparison rate. Finance is provided by Allied Retail Finance Pty Ltd t/a Suzuki Finance ABN 31 609 859 985 Australian Credit Licence No. 483211. Offer only available on MY18 RM-Z motocross models. Applications must be approved before 31 March 2019 and vehicle must be delivered by 15 April 2019. Please allow up to 8 weeks for exhaust delivery. Labour cost of fitting the Yoshimura exhaust system is additional, please enquire with your nearest Suzuki Motorcycle dealer. In motocross, you've got to get instantly hooked up - both out of the gate and off the corners - and also blisteringly fast down the straights. To give riders an even stronger winning balance, the redesigned RM-Z450 engine has more low-end torque, a flatter overall torque curve, faster and yet more controllable throttle response, and more peak power. Inside the airbox, the air-filter aperture is now 30-percent larger for enhanced airflow, and an MXGP-style mudguard helps keep mud and dirt out, contributing to greater engine durability. The outlet tube leading from the airbox to the fuel-injection throttle body is also straighter, reducing intake resistance for increased power across the rev range. The RM-Z250 continues to deliver a high level of performance for 2018 by incorporating a variety of features originally created for Suzuki's factory race machines. 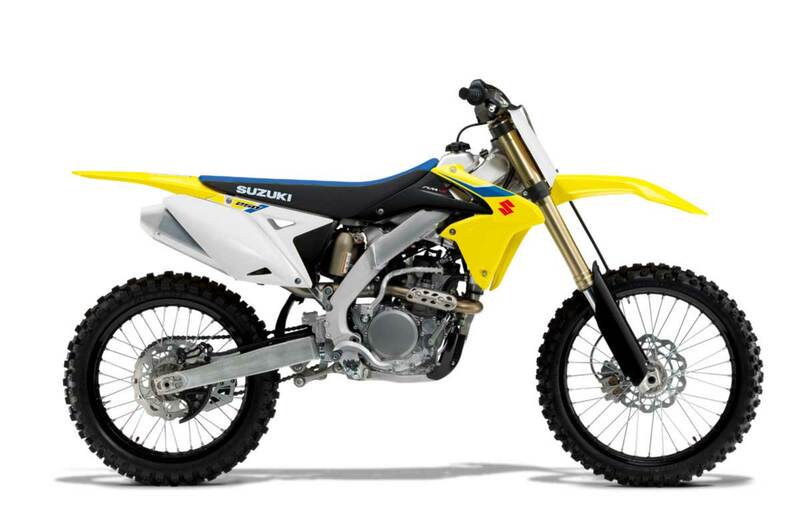 The 2018 model receives the same Champion Yellow colour scheme with blue accent styling inspired by the factory MXGP machine. 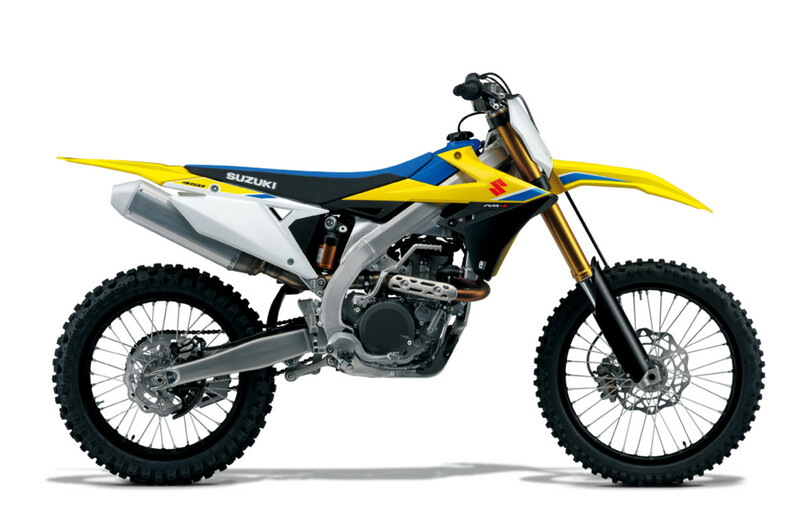 The RM-Z250's engine has been refined over the years to offer stellar mid-range power and torque is enhanced while maximum power is maintained. Power delivery is smoother and linear for easier control. Taking features and performance upgrades directly from the Suzuki MX2 and MXGP World Championship factory machines, the 2018 RM-Z250 is ready to excite.